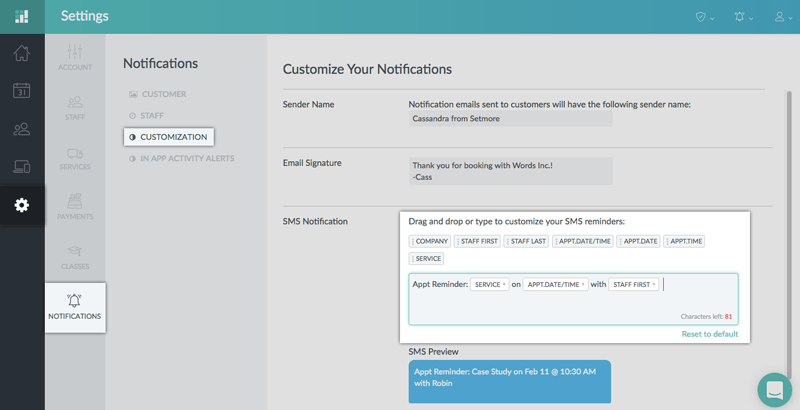 With Setmore Premium, you can automatically send out customizable text/SMS reminders before an appointment to make sure your customers show up. Below we'll walk through how to set up, customize, and set the lead time for text reminders. Only one text reminder will be sent for a booked appointment. At this time, Setmore does not support sending text reminders for class bookings. Text reminders are sent for regular calendar appointments only. Text messaging may not work with 100% send rates in all countries. See below for instructions on how to test sending a text reminder through Setmore. 1. Navigate to Settings > Notifications > Customer. Scroll down to the Appointment Reminders section and, where it says Text, click the On/Off switch to the "On" position. 2. 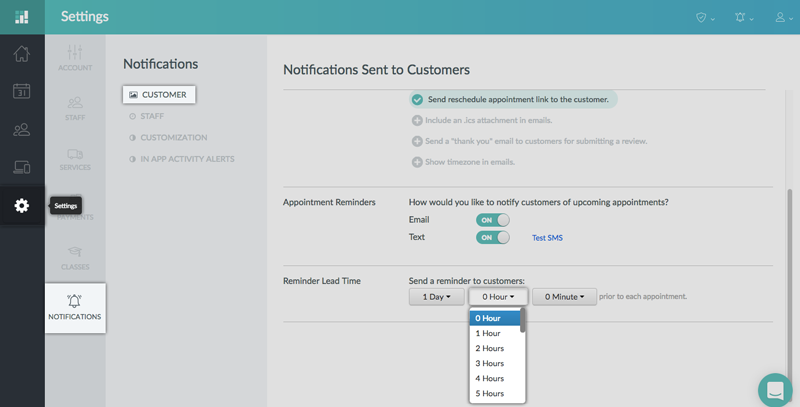 Text appointment reminders will now be sent out to your customers using the default message, at the time specified under "Reminder Lead Time" before the appointment is scheduled. Your customers must have a valid phone number entered in their customer profile to receive a text. Navigate to Settings > Notifications > Customer. Scroll down to the Reminder Lead Time section and use the dropdown menus to specify the time before each appointment when reminders will be sent out. You can select a lead time of up to 30 days. Navigate to Settings > Notifications > Customization. Scroll down to the section titled "SMS Notification." Here you can enter your custom text message for text reminders. Setmore's editor provides a number of variable fields that will automatically plug in the appointment's information. Click anywhere outside the form field to save your settings. Text reminders are not supported in all countries, and in some countries the successful send rates may vary depending on local cellular providers. Therefore it is always a good idea to test your text reminders within Setmore. 1. Navigate to Settings > Notifications > Customer, and scroll down to Appointment Reminders. Make sure that text reminders are activated, then click the link "Test SMS" that appears next to the On/Off switch. 2. Enter your country code and phone number in the form fields provided and click the "Send" button. In up to a few minutes, you should receive a generic text message from Setmore. 3. If you don't receive a text message, then text messaging may not be supported in your country or cellular coverage may not be good enough to ensure 100% consistency and accuracy when sending text reminders. You may also email help@setmore.com to inquire about text/SMS sending in your country. If you have text reminders enabled, you can check whether or not a text reminder was sent for a specific appointment by clicking on the appointment in the calendar tab to open the Appointment Details menu. A new line item will appear that reads "SMS status." The status will indicate if a text reminder was successfully sent, if the reminder failed to send, or if the customer disabled receiving a text reminder.